James Goldberg’s poem “In the Beginning”* exults in orality. 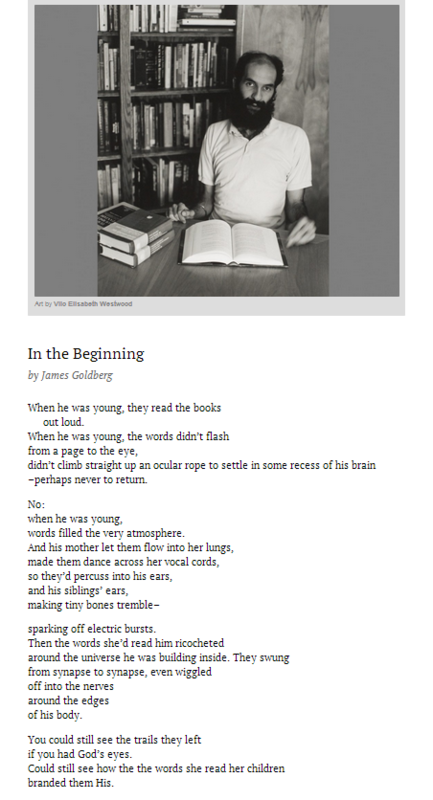 It begins, “When he was young, / they read the books / out loud.” But the poet doesn’t revel simply by stating that his experience with language is grounded in the spoken word. He also alludes to the revel-atory power of speech with his title, which echoes John the Beloved’s (later the Revelator’s) witness that “In the beginning was the Word, and the Word was with God, and the Word was God” (John 1:1). What we read as “the Word” is here translated from the Greek term logos, which according to Strong means “something said.” So John’s “Word” refers to something spoken, an idea mirrored in the additive, parallel structure of his opening statement, whose coordinate structure (“. . . and . . . and . . .”) parallels the rhythms of spoken language. When translated with the article, as it is in John, “the Word” refers especially to “the Divine Expression,” who is Christ, who was–who existed–“in the beginning,” before taking on flesh, and who did so “with God” and who “was God.” Through this witness of Christ, when heard in conjunction with what we now have as John 1:2″“5, it becomes clear that Christ is the Father’s deepest, most creative, most transformative expression to humanity. He is the Father’s promise of salvation spoken through the very structures of the cosmos.